I'd like to introduce a new friend of mine, the lovely Lisa Porter, who also happens to be a blogger and accomplished artist. Lisa took some time out of her busy schedule to share more about herself and her work, as well as send along a few samples of her exquisite watercolors. What is your earliest memory of being involved in the creative process? My earliest memory of wanting to explore watercolor was in 5th grade. I had a wonderful art teacher, Mrs. Ellis. On a hot Arizona afternoon she invited our class to her home for a pool party. We arrived in swimsuits, only to find an empty pool without a drop of water. Always the teacher, Mrs. Ellis supplied us with brushes and watercolors and the freedom to paint whatever our little 5th grade hearts desired. Our palette was the inside of her pool. She had always told us that it was ok to color outside the lines. Where are your roots and who influenced you most artistically? I’m a native Texan, born in Lubbock and raised in Arizona. I’m an only child with a talented family history. My father and uncle were both wonderful designers and architects. When I was a teen, I remember sitting in my room for hours drawing floor plans for my very own, grown-up dream house. My mother has always had classic style, sophistication, and a keen eye when it comes to fashion and interiors. My grandmother had beautiful taste and was a collector of fine antiques. I consider my desire to create and surround myself with beauty a gift from all of them. My favorite book is "You Are Special" by Fred Rogers. I grew up watching Mr. Roger’s Neighborhood in the 60’s. When my children were babies, we were living in southern California and I took them to his book signing in Newport Beach. They had no clue who he was but I was practically in tears when he greeted us. He extended his hand, was quiet and kind and spoke directly to my children. He told them, “You both are special, your mom knows it and now so do I.” This book is full of memories and wisdom for me as a child and as a parent. I guess that’s why my favorite subjects are children. I like to paint what I know and am familiar with. It’s my way of acknowledging and preserving what is so important to me. I like to step back, and quietly, from a distance, capture what is close to their heart. Many of my pieces are simply glimpses into an everyday moment of a child. The architect in me also enjoys painting the many layers of a beautiful home. I like to examine the medley of colors and texture found in wood, stone and lush gardens surrounding a residence. My greatest joy is when I am approached by a client for a commission. I consider this to be both a privilege and a compliment. Being an artist gives me a chance to look deep inside and remind myself that I have so much to be thankful for and so much to give back. Always mindful of my family’s needs, homeschooling two teenagers, managing a busy house with four different schedules, and maintaining the gardens is just one side of my busy life. Doing a watercolor brings my life to a quiet, calm pace. It gives me a chance to focus on only one thing. This is the healthy balance that I need which translates into wellness for me and my family. Which artists have inspired you the most? Many artists have inspired me over the years. Many of them are not widely known. When I was a college student in Austin Texas, I worked part-time for an artist by the name of Robin Roberts. 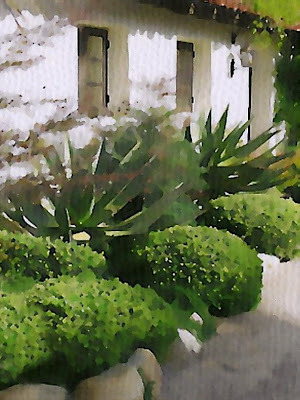 Robin is well-know for her watercolors of the Texas hill country. I did all of her framing and on weekends assisted her with her shows. She became a close friend and mentor. As a bonus, she generously supplied me with paper, brushes and endless encouragement. She taught me how to use watercolor. I have one of her pieces hanging in my home in Lexington. My uncle was also a fabulous artist. He never knew how much I was influenced by his work. His bold use of color caught my eye, however, the fact that he would paint only what he loved and wanted to display privately in his own home, influenced me even more. He taught me to paint what I loved, not what I thought others would want to see. Since we currently live in Kentucky, my favorite destination is out west to be with friends and family. That means, Arizona, La Jolla and Del Mar California and Texas. I always seem to gravitate back to the beach though. It calms me. Don’t you mean shops? Well let’s see….Williams-Sonoma, Seaside Home La Jolla, Rodger’s Gardens in Newport Beach, and I cannot live without Target. Well, of course Annechovie. It was you Anne, who inspired me to show my watercolors in a current, daily dose, kind of way. Your kind comments and encouragement mean so much, especially coming from such a talented artist as yourself. I also like to stop by and put my feet in the sand at Velvet & Linen, and Beach Bungalow 8. We used to live in Manhattan Beach and I miss it terribly. My other stops include stalking Joni at Cote de Texas because, well, I’m an impassioned Texan. Lately I’ve been getting up and having my morning coffee with Patricia Gray and some of my lovely new Australian friends. I love to peek over The Laurel Hedge, and at Gardens by Coty Farquhar. A new fun place to see what the young set is up to is over at According to Nina. Blogging has opened up a whole new world for me. I am so pleased to have found and visited with so many warm, friendly, funny, and talented people. It is always a refreshing way to start the day. Thank you so much, Lisa, for this peek into your life and studio! Be sure to visit Lisa's blog here! I have such an admiration for portrait artists and watercolorists as that is not my forte. Lisa is so talented, Anne, thank you for the feature and interview! Lisa's work is lovely - very tranquil. Thank you for introducing and sharing her work with us. I will visit Lisa. Anne- It is so gracious of you to feature the work of fellow artists, and so interesting to learn about their backgrounds and influences. Again, cream rises to the top and Lisa's work is "la creme de la creme!" The portraits are fantastic and very dreamy. I'm definitely bookmarking this site for future use. Thank you so much for the heads up Anne!! Oh my goodness! You took my breathe away!! Very beatiful art. She captures the highlights in each of her pieces. I've recently become acquainted with LP and think she's got such talent. Thanks for highlighting her here. Beautiful-but I wasn't able to link to her blog. What is Lisa's blog? I'd love to visit. Indeed an most talented artist! Her watercolours are positively surreal in their beauty and technique. Thanks for sharing! I am enjoying your "chair" stationery by the way. I am in love with your talent. I am looking for someone to paint a picture that I have of my kids. Do you do that? Beautiful work..so life like and pretty! Lisa Porter's work is absolutely Breathtaking! Gorgeous! What an outstanding talent! Thanks for posting these bold and beautiful watercolors. I am touched that you have your morning coffee reading my Blog. I hope that one day we can have that coffee together in person. Was happy to hear from you today Anne! I adore my stationery and will look forward to doing a post to share your talent and Etsy store with my readers. I'll keep you posted. Wow- These portraits are breathtaking! Such life is captured in each one. Thanks for sharing them! Anne thanks for this! Lisa's art work is incredible, so pretty! I was so surprised to see my blog included in her reads. Thank you, Lisa - very much! Oh my, how lovely. Watercolor as a medium is tricky at best, but these are truly divine! At first glance, I didn't even realize the children were paintings! Nice interview. I've enjoyed reading through your blog and looking at your art. Very nice work. Oh my goodness! These are amazing watercolors! I can't believe the quality. Not really like anything I have seen before. Ces réalisations sont d'une grande beauté. Thank you for featuring Lisa Porter....a fabulous talent...I look forward to following her blog!! They are beautiful pictures - but so realistic they appear photoshopped. Rather interesting blog you've got here. Thanks the author for it. I like such themes and everything that is connected to this matter. I would like to read more on that blog soon.